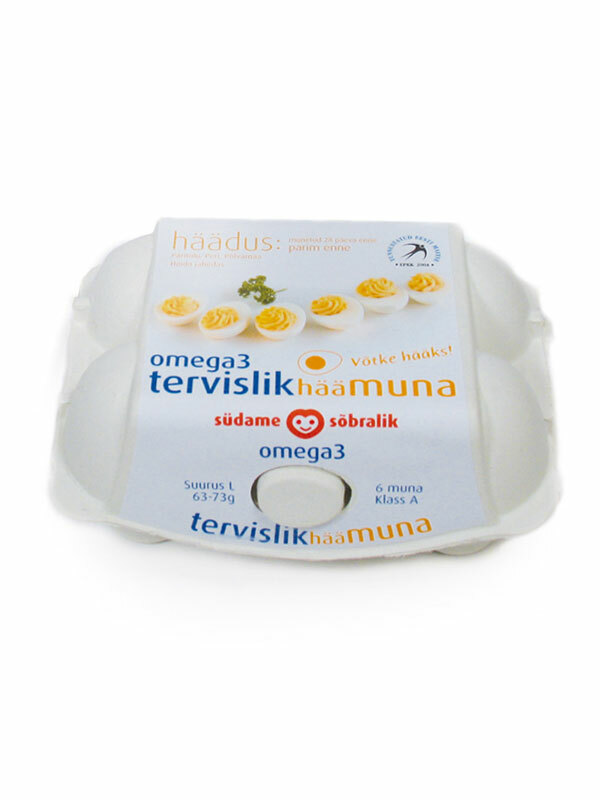 This is the flagship product of the häamuna range and is the most exclusive packaging of Estonian eggs. During research on egg packaging, Emajõe Disain found the producer of this new, innovative “iMagic” egg carton design and häämuna chose to be the first to use it in this region. The pack shape itself makes this product distinctive and combined with the wrap around full-colour label, results in a very elegant branded product. The design is clearly coordinated with the range of häamuna in the more usual cartons, but rather than a 1 colour wave of egg symbols, here the motif is executed with a full-colour photo of stuffed eggs. Produced in packs of 6 or 10 eggs. As usual with häämuna, the wave contains the same number of eggs as in the pack. This distinctive wave element also means that packs “work together” when placed side-by-side on the supermarket shelf. The design is also innovative in that it makes prominent use of the “best before” date as a marketing device, not just a legal requirement. In addition, the ‘hää’ part of the brand is used to state “goodness” highlighting the best before information.